Centennial Adultcare Center is an organization of trained professionals dedicated to providing our members with a high quality, innovative, and comprehensive program of social and therapeutic services in a safe and caring environment. Each member participates in a structured program involving a wide range of activities including physical and mental exercise, socialization, and games designed to put the fun and activity back into their lives. We provide our members with assistance with the day to day activities of daily life while preserving their individual dignity and providing much deserved and needed respite and peace of mind for their caregivers and families. 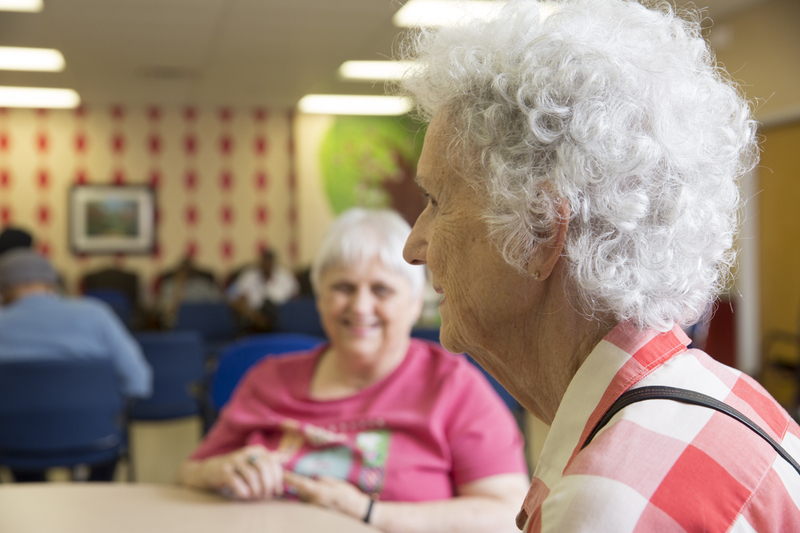 Centennial Adultcare Center is designed to fill the gap between living alone at home, or with a caregiver, and full-time institutionalization in a costly nursing facility. Our fun, activity filled day and time spent with new friends brings a smile back to their faces. Here’s what people say about us. Looking at the local Adult Day Centers, none of them met their needs. One was very small and would not accept participants who were incontinent, needed transfer assistance, or had significant memory loss, and the facility was on the first floor of a high rise. The second was on the second floor of a Senior Center and similarly would not enroll anyone who was incontinent, that wandered, or had major memory loss. The third was linked to an Assisted Living and Nursing Home facility and also would not accept anyone incontinent, that needed transfer assistance, or showed significant memory loss. In 1989, Steve and Mary Lou Zagorski were dealing with the rapidly declining health of Steve’s mother and had several friends with parents who had Alzheimer’s and other age related problems. None of them wanted a Nursing Home or Assisted Living placement. While looking for an alternative, they discovered Adult Day Centers. In December 1989, they began preparing a business plan to attract an investor that would help with some of the money. After months of planning, searching for a site, developing policies and procedures, visiting other Centers around the U.S. for ideas, paying consultants, meeting with physicians, clergy, and anyone they thought could help, the development began.Centennial Medical Center liked the idea and had an empty physicians building in Green Hills. After the lease was drawn up, the construction began to make their vision come to life. After almost 16 months of planning, raising money, finding a location and renovating a building to become an Adult Day Center, the time to open had finally arrived. On February 18, 1991, Centennial Adultcare Center, the most comprehensive Center in the state of Tennessee, opened its doors. The first member to enroll was a woman with advanced Alzheimer’s disease. Later, more members joined. Even though the total number of members was low, families came to Centennial Adultcare Center because of the outstanding activities program that kept their loved ones occupied and engaged. Centennial Medical Center liked the idea and had an empty physicians building in Green Hills. After the lease was drawn up, the construction began to make their vision come to life.After almost 16 months of planning, raising money, finding a location and renovating a building to become an Adult Day Center, the time to open had finally arrived. On February 18, 1991, Centennial Adultcare Center, the most comprehensive Center in the state of Tennessee, opened its doors. The first member to enroll was a woman with advanced Alzheimer’s disease. Later, more members joined. Even though the total number of members was low, families came to Centennial Adultcare Center because of the outstanding activities program that kept their loved ones occupied and engaged. In April 1992, the Veterans Administration contracted with Centennial Adultcare Center to offer a facility to serve the veteran community, something the VA had done in other parts of the U.S., but was the first in the state of Tennessee. In 1994, Centennial Medical Center decided they wanted their building back for physicians’ offices. This meant relocation and remodeling another building. In April 1995, after another search, design, and construction project, the center relocated to its current location at 1808 8th Ave South. In 2003, Centennial Adultcare Center added Non-Medical In-Home Services as an addition to Adult Day Health Care. We added Personal Care, Homemaking Service, and Respite Care, to better serve the Nashville community and prolong community based living. Finally in 2010, we began offering minor home modifications as well, to allow the elderly and disabled to remain in their own homes or that of a loved one. It is our long-term goal to help families with whatever they need involving elder care. In 2013, Centennial Adultcare Center finished yet another renovation project, expanding the Center to include new bathrooms, showers, offices, and activity rooms, providing an increase in capacity, as well as to have more space for our current members. On January 1st, 2015, we opened our second location at 230 Glenis Drive, Suite 302, Murfreesboro TN, 37129. This was our first expansion outside of Nashville and will allow us to provide Adult Day Health Care, and Non-medical In-home Care in Rutherford and surrounding counties south of Nashville. We are already serving clients in Murfreesboro as well as Lebanon with an expanded transportation area as well. Andrew Keen is our Program Director in Murfreesboro. He has been learning and implementing our programming, goals, objectives, and daily operating schedule since he took over that position in 2016. Bill Zagorski has been mentoring him directly in the location at least weekly. Identical to Nashville, we are licensed with the State of Tennessee, are a provider for the State OPTIONS program through GNRC-AAAD, and as a CHOICES provider through the State Medicaid/TennCare program with all three managed care organizations. Additionally, we are a contracted Veterans Affairs (VA) Adult Day Health Care Facility and provide our services to qualified veterans at no additional cost to the veterans or family! Currently, we serve more than 20 members each day at the Murfreesboro center, and are licensed to serve 45. On July 1, 2017, we opened our third location, this time in Mt. Juliet! Saving Grace Adult Day Care transitioned ownership and operations as of July 1 and is now owned and operated wholly by American Senior Care Centers, Inc. dba Centennial Adultcare Center. Currently, Saving Grace is a social model adult day service center licensed for 12 members each day. Similar to Nashville, we are a contracted provider with GNRC and all three managed care organizations with the CHOICES program. In July, we had roughly 2-4 members per day, but by September, that number had swelled to 7-10 per day. Nursing services were added in September as well, and the search is on for additional space to allow us to serve more individuals throughout Wilson County and the surrounding areas. Please stay tuned for upcoming announcements about expansion! A history of success and caring. Our best years are still to come. Steve and Mary Lou wanted to have a more comprehensive Adult Day Center serving a wider range of participants: one that had a Registered Nurse on staff and administered medications; one that would help those that were incontinent; one that would be designed so that it could accept someone that wandered; and most important, one that would take individuals with moderate to severe memory loss. They were searching for one that would significantly delay Nursing Home placement.